How To Find Out Who Isn't Following You Back On Twitter? Social media is all about connections. But while Facebook might be referred to as an on-stage microphone, Twitter is more like a two-way radio, where businesses rely on interactions to grow (which is kind of ironic, considering it is Facebook that requires mutual consent for a connection). If you're active on Twitter, you may know that when you follow someone, they might not always follow you back. Well, you can use tools like FriendOrFollow to find out who isn't following you back, and who is inactive etc. Sometimes, people will follow you just so you'd follow them in return, and then they'd silently unfollow you. This practice is so against the general aesthetics of using social networks such as Twitter, Google+, Instagram, and so on. 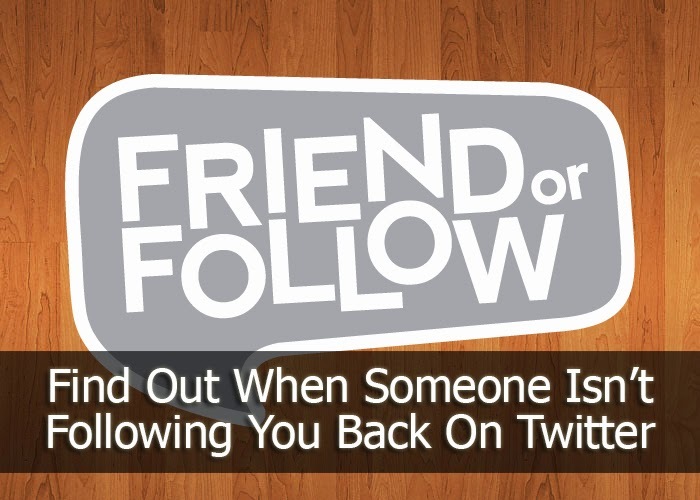 Friend Or Follow is a great online tool that you can use to identify which users aren't following you back on Twitter. It is totally free. Friend Or Follow doesn't just focus on Twitter, but will also take a look at your Instagram and Tumblr if you so allow it to. It allows you to sort users by various factors, including whether or not they’re verified, when they last tweeted, how old their account is, or how frequent they tweet, etc. The tool is free, but you can pay for some advanced features. I, however, would recommend sticking with the free version, as it more than serves its purpose. Follow these steps to find out who is the traitor who hasn't followed you back! Once logged in, you can select the account you want to monitor. You can choose from Twitter, Tumblr and Instagram. If you trust this method I'm telling you about, go ahead and enter your Twitter username and password and authenticate the app from your account. You will now see a list of all the people who haven't followed you back! assalm o alikum qasim bro. bhai jaan me jab koi bhi article facebook ya google+ per share kerta ho to us me article per lgai hoi picture ane k bjae meri picture show ho rahi he. Asslam o Alikum Qasim brother..
Bhaiiii jan boht hi shandar boht hi aaalaa Article hay thankx to sharing with us.